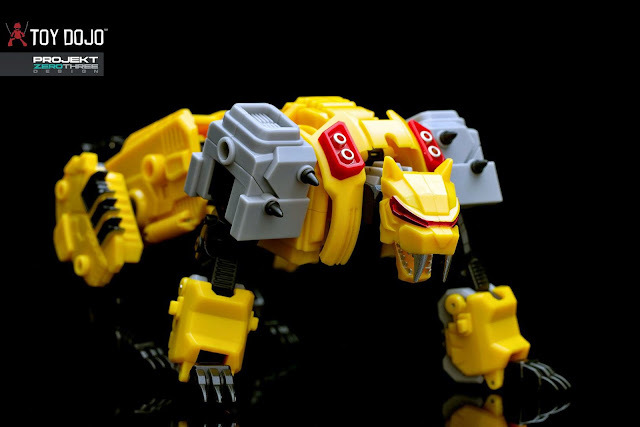 Dojo Digest - WWW.TOYDOJO.COM: MasterMind Creations Felisaber, or Who the Heck is Catilla? MasterMind Creations Felisaber, or Who the Heck is Catilla? Who is this last member of Feral Rex? 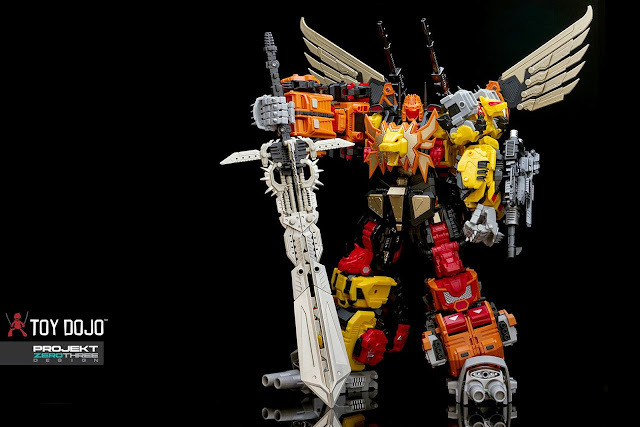 Felisaber, the sixth member of the MasterMind Creations Predaking homage known as Feral Rex, has raised a few eyebrows in the collecting community. 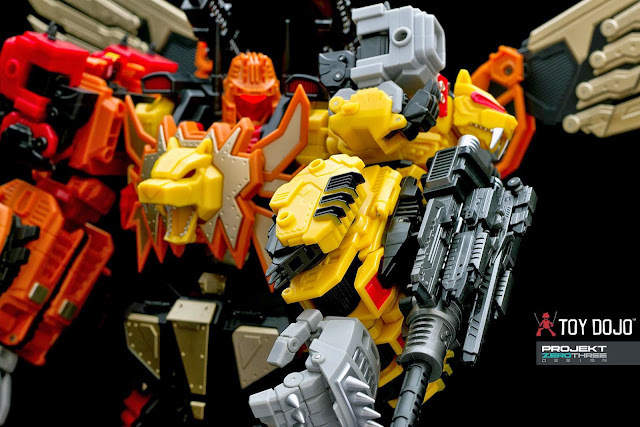 We already have an accurate Predaking, so why do we need a yellow sabertooth tiger limb? While I more than understand skipping Felisaber, what I aim to do here is convince you that MasterMind has made a really cool and creative choice with this figure. The Transformers character they've chosen to homage is a very obscure one, even by diehard fan standards. Felisaber is a representation of the 1988 Pretender Beast Catilla. "But Patrick," I hear you Google-masters cry out, "it says here that Catilla is an Autobot! 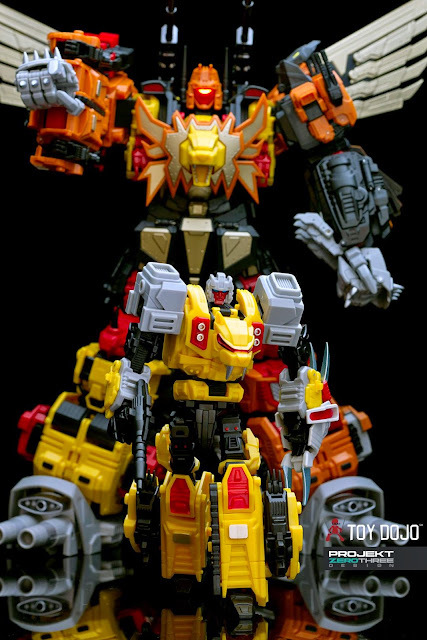 Why would he ever join the Predacons?" To which I can only reply, sit back, cause I'm about to spin a strange story. Two characters you've never heard of were used to tell a Transformers story that was well ahead of its time. And the only reason I know anything about it is because of my choice of reading material on a plane trip, six years ago almost to the day. It was my very first plane trip from Maryland, where I went to college, and Texas, where I live now. I flew down for an interview, which fortunately paid off. I have a tradition, then and now, of picking up some new reading material for a flight, usually a trade paperback of comics. And in my local comic shop my interest was piqued by a little book called "The Transformers: Time Wars." "Time Wars" was a story arc in the Marvel Generation 1 series. Most fans know that Generation 1 fiction started concurrently as the more famous TV series and as a Marvel Comics series. What is less generally realized is that a great many of these Marvel stories were exclusive to the United Kingdom, forming a somewhat distinct timeline/franchise called "Marvel UK" or "Transformers UK." 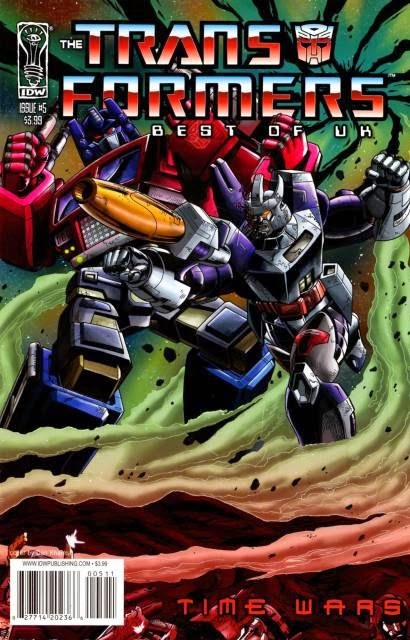 If you are interested in exploring this well-regarded era of fiction, I heartily recommend "The Transformers Classic UK" omnibuses currently available from IDW. 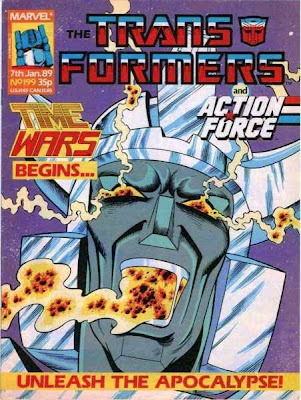 Anyway, there's a lot going on in "Time Wars," but one issue deals with an alliance of Autobots and Decepticons to take down Megatron and Galvatron (it's called "Time Wars" for a reason). Two of the Decepticons are Pretender Beasts...Carnivac, and Catilla! What's going on? Is this a simple error? It's more than that. Author Simon Furman was laying threads for the post-Time Wars comics here, and he decided to set up a heretofore unprecedented storyline for the franchise: a faction shift. The only noteworthy thing Catilla does in "Time Wars" is survive. 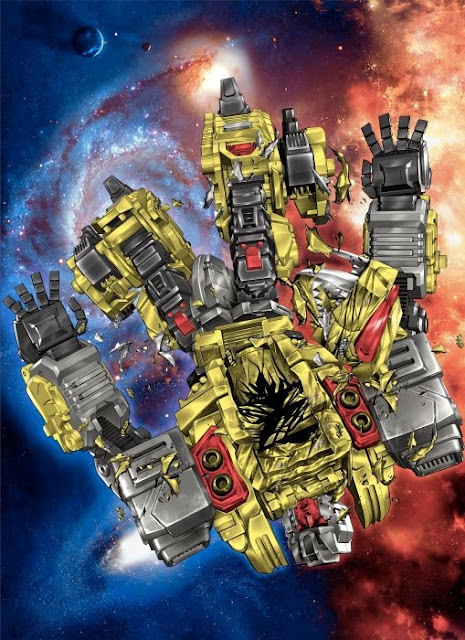 So does his leader Carnivac, as well as the Autobots Springer, Inferno, and Broadside...the other twenty-five Transformers in their group were torn apart by Megatron and Galvatron. In subsequent issues, the five warriors band together after their horrific encounter and have several other adventures. Springer extends the two Deceptions an invitation into the ranks of the Autobots. Carnivac refuses--he may be their friend and ally now, but he keeps his Decepticon badge. Catilla, however, becomes an Autobot. Now the character matched the toy. Catilla's story wasn't quite over, however. The rather more well-known Pretender Bludgeon is dispatched by the Decepticons to execute the traitors. In a fierce melee, Bludgeon kills Catilla. This drives Carnivac mad with grief, and for the remainder of Marvel UK he mercilessly stalks his former Decepticon colleagues. Catilla may have lived and died just to facilitate Carnivac's storyline. In retrospect, Carnivac is a clear precursor to popular turncoats like Beast Wars Dinobot and Armada Starscream. However, later authors have used Catilla here and there in cameos. Due to his odd history in G1, he's been a Decepticon as often as an Autobot. 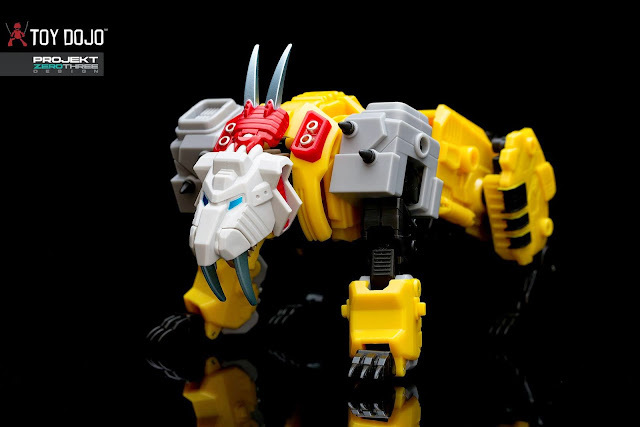 Given his more-than-appropriate alt mode and his similarities to Razorclaw and Rampage, it's easy to imagine him as a sometime Predacon. MasterMind Creations' Felisaber is a rare modern homage to one of the most obscure--yet historic--Generation 1 Decepticons. His styling is even similar to Hasbro's modern Pretender homages, in that he lacks a separate shell, but elements of his alt mode call back his original toy's helmed organic form. 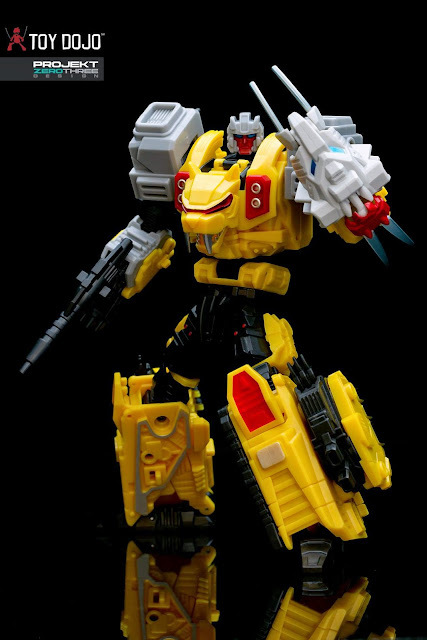 His inclusion in the Feral Rex combination is an example of the spark of creative innovation that has consistently made MMC one of the better unofficial transforming robot manufacturers. This blog makes me want to purchase this figure now. Lol. Thanks for the history because I had no idea who Catilla was.